A 3 Alarm fire broke out today at the 2500 block of S. Susan St. at 10:15 a.m. according to the OC Fire Authority. Over 85 firefighters from the OC Fire Authority and the Fountain Valley and Costa Mesa Fire Departments fought the blaze and the OCFA Hazmat team was there too. No injuries were reported. 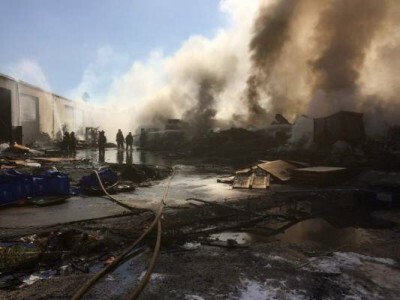 The fire happened at JP Plastics, Inc., a full service plastic recycling and processing company. 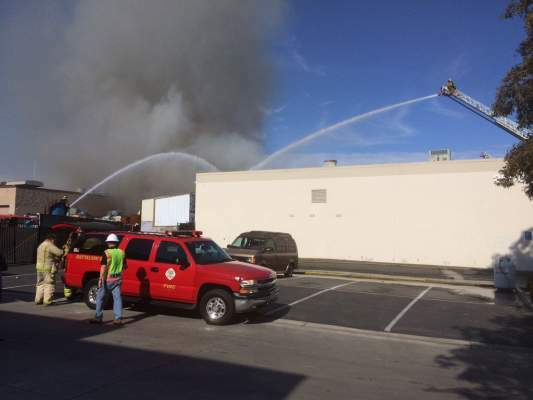 The OC Register reported that the fire involved a large plastic bale located behind JP Plastics. The OCFA was not sure what ignited the plastic trash heap, estimated at 15 feet tall, 75 feet long and 40 feet wide. Firefighterz..You all did a hella Job..put that blaze out fast as lightning..You Go !! Thank God for you Guyz !! !